On the center island is an Inn, where you can heal up if you took damage from the Slimes earlier. If you go through the eastern door of the Inn, you can get a Cloth Suit from the dressers. This man also owns a Weapon Shop, and you can browse his wares for any items that may help. You can get 12G from the vase in this house, as well. Maneuver your way over to there, and go inside. A small boy, named Patrick, is trying to help his father, Hank, get well. He knows that a green colorstone, from the Mine southeast of the village, is just what is needed to heal him. He wishes to ask Matilda, who helps protect their village from monsters, to go and find this colorstone for him. Inside, smash the barrels south of the building to find an Herb, then head inside the mine itself. There are random enemies in here, just like out on the World Map, but the fights here are a little more difficult. Take the path west at the fork, and follow the tunnel north to find Matilda. Continue along the tunnel, and go west again, breaking the barrels for a STRseed, and 40G, before heading east and taking these stairs down. Head west, then south as you reach the large room. The path will split, with one part going west, and the other part going east. Now, just go north and push the two blue crystals together, and you can reach the stairs going down to the next floor. Head north, and follow this tunnel to the next set of stairs heading down. You can ignore the yellow and blue crystals here. On this floor, avoid touching the red crystals, and stand to the east of the blue crystal. Walk west, so the blue crystals shatter, then look at the red crystal east of you. Walk around to the eastern side of it, pushing it west until it is lined up under another red crystal, causing them to shatter. Walk over to the eastern yellow crystal, and push it west until it shatters. Now, go east to the red crystal there, and push it west until it breaks. Next, move the center red crystal, to the west, so that it shatters also. Move the northern red crystal a space to the east, then walk east, north, west, and south, so you can push the yellow crystal south. Circle back around to the east of this yellow crystal, and push it west until it breaks. Move around to the eastern side of the room, then go down the stairs, and walk over to the green, glowing crystal. Luckily, Matilda will show up, and aid us in getting a piece of the colorstone! She will also give us a Wood Doll, which was given to her by her big brother many years ago. Take the western path, and climb up the stairs when you reach them. Throw the pot here for 20G, then go back downstairs, taking the eastern path this time. Now, head back outside. The Golem recognizes Hank, and vows to kill him, and us too! Have Maribel cat a Sap spell or two if she has it, then have her switch to Blaze. Your hero and Kiefer should attack, with a Heal spell thrown in when necessary. Now we just need to get back to the Ancient Fane Return, and walk inside the unguarded door. Move north, and go down the stairs, then go south and down the next set. On this floor, you guessed it, move north. The one to the east has a Bronze Knife, and the one on the right has a FireShard! Head up the stairs to the east, and then go up the stairs again. In this room, smash the vase for 5G, and open the chest to get a Leather Shield! Go back down to where we found the two chests, and take the stairs west of them. Head upstairs again, and then again. Move south, and go upstairs here. You can jump off, without being hurt, incase you need to leave quickly for healing or saving. Follow the path west, then south, before going up some more stairs. Take the north path, then go east and south when you see the pillars. Help yourself to the DEFseed and 80G, then move south to another staircase. Infront of you, a crab-like monster lies in wait. Have Maribel use Sap, and then Blaze. Kiefer should attack, as should your hero, but make sure to use a Heal spell on whoever the Clawser hurt last round. It was Matilda all along who was in control of the monsters here, all because of her hate for the cowardly villagers for allowing her brother Rex to die all those years ago. Should you kill Matilda? You can complete the battle for some EXP and Gold, or just run away. In either case, you will have to decide if you should stop Hank from killing Matilda. Whichever choice you make, Matilda will fade away, but not before telling you that you should return to the clearing you met her at. After commenting on the trophy he was given, Patrick wanders off, and Hank will give you some encouraging words inside the house. The flowers Matilda planted have all blossomed, too! If so, the WindShard fits on the northwest pedestal in the Green Pedestal Room, in the northwest corner. Return home to Fishbel, and Maribel will head her seperate way. Hurry to Estard, and try to enter the castle. Who could he mean? Indeed, Kiefer is sitting there, waiting for us to show up. This makes Kiefer decide that you and him should use your Secret Weapon! Walk back to Fishbel, and go to the dark cave with all the barrels and vases, to meet up with Maribel and Kiefer. Together, you move the stone lid, and descend the stairs. It seems that you and Kiefer have a ship! I hope Kiefer is a good ship-repairer Luckily, the ship sails without a hitch, and you should try to go north of Estard. Get off of your boat, and walk into the village, to find a very very familiar village, Rexwood! Straight ahead of you is the Inn, where you can rest and heal up. Enter the large building where the Inn was in the other Rexwood, and climb the stairs up to the third floor. Break a vase for an Antidote, then head up to the top of the building, to speak to the man here. We just participated in it! As we ponder this over, wander over to where the Weapon Shop was in the other Rexwood, and search the dressers here for a Leather Hat. Lead your confused party to the Colorstone Mine, and break the barrels outside of the house here for 13G. The barrel west of the house has an Antidote inside. The layout of the Mine is identical to how the other colorstone mine was. Maybe you really did go to the past somehow. In any event, head west at the split, then move north, passing the room you met Matilda in, so long ago. Literally, if we really did go to the past. Head back east, and go down the stairs here. Move south through this large room, turning east when you can and walking down the stairs. First, move the red crystal all the way to the west, so it breaks, then go south and move the blue crystal west until it breaks, too. Push the yellow crystal all the way north so that it shatters, then circle around and push the east blue crystal, all the way west. Now you can safely go down the stairs! Now, push it east, and it should shatter along with another red crystal. Push the blue crystal a space east, then a space south, before push it all the way east so that it breaks. Now you can run over to the stairs leading further down. Push it south five spaces, then push it all the way east, so that it breaks and frees a blue crystal. Circle around again, and push this blue crystal all the way to the west, then go downstairs. Walk around the edge of the room, then walk down the stairs to the east, so you can reach the center of the room. You want to push the blue crystal north, so that it shatters, and then push the yellow crystals out of your way. Kiefer suggests that you should go back to the castle now, but first you need to leave the Mine. Return to Estard Castle, and talk to the western guard, to lower the drawbridge again. Move downstairs, and then downstairs again, to find the Crazy Old Man on the Cliff, by the jail. Talk to him, and Kiefer will order him to open the door, so that the Crazy Old Man on the Cliff can go downstairs, and so can you. Talk to the captain to make him move, then hop on the raft and sail out into the moat. Sail south, west beneath the drawbridge, and north, to dock your raft and explore this area of Estard Castle. Move to the southwest corner of the Castle, and walk inside. Move east, down the stairs, then down the next flight of stairs. Smash the vases in this room for an AGLseed, then search the bookshelf. It seems that he used to have this Shard himself, but a previous King confiscated it. On the way out, though, talk to Hondara at his house. Now, make tracks to that Ancient Fane! Walk inside the blue door with the flame above it, then walk inside the blue swirling energy here. In any case, walk back into the energy swirl, then walk into the Red Pedestal Room, and set your FireShard in its place on the northwest pedestal, to the east. Here we go again! As you party travels through the Gate, you will see a vision involving two people throwing a torch inside a volcano. They flee, as the lava rushes up and causes a volcanic eruption. You will appear outside of a small fane, with the blue swirl of a Gate already there. In any event, walk east, ignoring the path south of you for now, then following the mountains south when you reach the coastline. Eventually, you will see a village, which you should enter of course. Directly infront of us is the Inn, which I am sure you need after the long walk here. The house above this one has a mother faking an illness, so that her son will not leave Engow and get hurt. A woman named Pamela is supposedly a fortune-teller of sorts for this village. Her son will run off to get some medicine after you talk to him. Nab the Cloth Suit, then go back outside. The next house to the northwest is actually a Church. Maybe she really is a fortune-teller. Break the barrel by the stove for an Antidote, then move upstairs. You can pick up a Horned Hat from a dresser, and one of the books on the bookshelf, "The Analects of Granaly," which says that hiding behind a shield does not make you a coward. She seems rather preoccupied right now, and scolds us for bothering her. I wonder what all the noise outside is about? Flame erupting at the very end of the Festival. The townspeople refuse to believe her, their beliefs about the God of Flame are much stronger than their belief in her predictions. The Mayor and Pamela walk off to talk privately, with a small cutscene describing how the citizens just refuse to believe. She asks for you to visit her at her room the first moment you can, so that you can do the heroic thing and save Engow. The plan is to sneak into Mt. You might want to save beforehand, just incase! Walk around the village, talking to the people and the Elder, taking in the sights. Walk to the northwest part of the village, and speak to the Elder, to get your torches. After the opening ritual, the citizens will start to walk towards Mt. Flame, as should you. Go a little northwest of the village, then move north until you arrive. Wander up the trail, talking to people as you go, until you reach the man standing at the front of the line. Flame, and toss your torches into the volcano. Rather than leave, circle south around the crater, to find Pamela by a door. She asks us to hurry and go inside, to see what the problem is, and tells us to talk to her for any healing or saving needs. Head downstairs, and then move east, to reach another staircase going down. Follow the tunnel as it goes northeast to some stairs, then north and west to another staircase. After you go down, a scene will play, showing another villager throwing his torch into the volcano. If all the torches get thrown in, the volcano will erupt! If you take too long going down or up each floor, another torch will be thrown in, until they all have been eventually. Head east and down the stairs, then move south to descend the final staircase. Grab the STRseed from the chest, then run back up all the stairs and go west past the stairs we originally came down. Move north, then down the stairs here. The next staircase you want is to the north again. Follow the tunnel southwest and south, walking east when the path turns, and going down the stairs. Take the northwest path here, following it until you reach a chest with a DEFseed in it. Run back the way you came, and head northeast, opening the chest you see for an Herb. Head west, down the next staircase, then move south and east to some more stairs. On this floor, exit the room from the southern door, to be on a cliff with a chest, and a Knife. You can also see just how many villagers are left in line before the volcano will explode. Head south, and when you see the fiery crater, jump into it! Jump down again, then walk into the green pillar of light to the northeast, to get all of your HP and MP restored to full. Once you have them, jump into the crater twice, to land on the bottom floor. Some weird red face is down here, with a large jar of darkish fire. Have Maribel use a Sap spell, then have everyone attack with their weapons, having your hero Heal when people are starting to take some damage. FireGiant has three attacks to torment your party with. He has a move where he can breathe flames, to damage everyone in your party at once. His most frequent attack, other than a normal physical blow, is when he uses up a turn to ChargeUp. You should have your party Parry for that round, as his blows will do extra damage, and the Parry will reduce it. Make your way back up, and outside to the crater. The Flame of Darkness has grown huge already, hovering and getting ready to cause unknowible destruction. Speak to Pamela, and tell her everything that you found inside the volcano. That has to be Hondara! A liquid in a jar he has can fix this problem. The day is saved! In celebration, in words the Elder can sum up better than I can, you all return to the village to celebrate. It seems your hard work here has payed off, and another land is safe. Make your way back to the Gate we came here from, and step through, to reach the Ancient Fane. Eager to see if a new land has indeed appeared here, Kiefer suggests that you should go to Estard Castle to find out. Sure enough, the King and everyone else, it seems, are waiting for you to report. Your father seems a bit more sensible, and just brings you home for a private talk. Tell him that you wish to continue, even without your friends if need be, and your parents will give their permission, and send you off to bed to rest before you go exploring anywhere else. Maribel knows that Kiefer has his princely duties, wheither or not he likes to admit it, so she says that you and her should go off to see the new volcanic island that was discovered. Your first stop is the vase east of the Inn, where you can pick up an Antidote. The house north of here also has an Antidote inside a vase. If the Engow we were in, was in the past, how can Pamela still be alive? She was pretty old then, afterall. The barrel down in the kitchen has 7G, while an upstairs dresser has a Cloth you can put in your pocket. It seems that ever since Pamela originally helped to save this village at Mt. Return it to the boy who lost it, to be rewarded with a TinyMedal! It seems that it is now a natural hot-spring. Climb down, and raid the dressers for a pair of Boxer Shorts. Walk up the trail leading inside the mountain, and enter the crater area. Move downstairs, then head east and down the stairs, just like we did in the past. Go northeast, down the stairs, then north and west to some more stairs. Go east and down those stairs, then south and down a final flight of stairs. Open the chest here to get a WindShard! Head back up to the stairs we came down from originally, then go west and north to stairs leading down. Move north, and down the stairs, then travel south and east to another staircase. Take the northwest path here, to a chest with 80G, then go back to the stairs and move northeast to get to a chest with an Herb. Walk northwest and west, down the stairs, then south and east to some stairs leading up. Move south and outside to the cliff, pillage the chest for G, then go back inside and up the next three flights of stairs. Walking west and south will get you to the central crater area again. Hop down twice, then deprive the chests in the southwest corner of an Antidote and 60G. Touch the pillar of light to the northeast if you need to heal your HP and MP, then jump into the crater twice more. Walk north and jump into the hole in the ground, to arrive at the WindShard chest again. You should be able to get out of here now. Before rushing off to place your Shards, take a detour to the blue door with the flame above it, in the Fane Dome. When you arrive, leave the room by the southern door, then go east. Now, go back to the Green Pedestal Room, and place your WindShard on the northwest pedestal, on the eastern part. Now, go to the Blue Pedestal Room, and place your second AquaShard on the northeast pedestal, on the southern part. One Shard to go! Walk over to the northwest pedestal, and place your last remaining AquaShard on the east side. Both the Church and Inn are deserted, but you can save and heal for free. West of the Inn, you can walk up some stairs to get to the upper ledge. The first house to the north has 7G inside, hidden within a barrel. Maribel and Kiefer are still asleep, so walk out of the Inn, to see all of the statues glowing white. A warrior named Claymore heads off for some supplies, and hopes to be back intime for the rain prayers. He worries about his crops, but after a young boy bumps into him, he can smile, and knows that the next generation will have a happy, bright future. Unfortunately, it looks like he was wrong, as even the young girl east of him is a statue as well. They make plans to visit it after the rain prayers Could he have caused this statue problem? The next statue to examine, is the one of a woman by the stairs north of the Church. The monsters outside are a problem, and it seems Clayman is the only warrior in Dialac. The two kiss, and make plans to be married once Clayman returns, before the vision ends. The old woman infront of the large stone is praying to the Boulder God. The priest walks up to her, and asks why she is praying to the Boulder God, rather than the Water God. This town used to be a battlefield, and was later rebuilt. But suddenly, it does begin to rain! A muddy rain, which is turning people into stone! He tries to go inside his house to warn his family, but never makes it through the door He mentions one base is near a pointed tree, where he made markings on a cliff, and that a second base is beneath the bar. This must be Clayman! Enter, then walk down the stairs here, to find a small room that could have been used for sleep-overs or the like. Move down the next flight of stairs, then go east. Take the Herb and 5G from the vases here, then go up a flight of stairs, before heading south, east and north to a rope. Use the AngelTear here, and daylight will return to Dialac. Hurry outside and talk to him! To Joseph, a few seconds have passed since he was moving around, but to the real world, fifty long years have passed. The next morning, Joseph and Clayman decide to warn other places of this gray rain, and to try to find a cure for the rest of the people, even though they may not find it. Where does our party go from here, though? Now, walk outside, and get in your boat. Once you arrive in the past, head directly north, to find a new village. This village is hardly a normal one, though: First, go west, and enter the Item Shop. Despite the owner being a chicken, you can buy and sell items normally here. Walk around to the back of the Shop, and search the hanging sacks on the wall for a DEFseed. Break the vases for an Herb, then get a HairBand from the dresser upstairs. East of the Item Shop, enter the house and raid the dresser for 5G. Directly north of this house, past the Church, you can find a Weapon Shop, with another chicken as the merchant. In the back of the shop, you can get a chest with a Copper Sword, as well. West of the Church, is the Inn, where you can stay for free. Break the barrels outside of the Inn for some Dung, then go north to another house. A vase here contains a Bone Knife, which none of your party-members can use. The westernmost of the two houses has vases you can break for 5G, and an Antidote, while the eastern shed has The cow here seems panic-striken, mooing loudly. Kiefer mentions that the cow probably knows the entire story, as does the rest of the animals in town. There is a squirrel, though, which offers you a MysticNut. Is he a fraud afterall? This has never happened to him, he says. Wander inside the Item Shop, and go to the second floor, to talk to the woman here. The woodsman will be surprised suddenly. There was a monster that tried to cause problems in this village. The white wolves were the defenders of the village, and they tried to stop the monster. But one by one, they were getting killed off. Enter the house east of the Shop, and talk to the old man, I mean horse, in the backyard to hear more of the tale. The wolves lured the monster away inside a cave, which was in Mt. The monster was sealed, and one female wolf lived, who happened to be pregnant. Now talk to the man, or dog, behind the Church. Recently, a monster came by to cause problems, and all the animals were turned into people, and people were turned into animals. Rather than stay, the boy quickly runs off! Maybe to go back home? Follow it up the trail, and into the cave it enters. Once inside, head north, taking the first path east that you reach, to get to a chest with G inside. Go back went, and further north, until the path splits again. Take the path that leads east, then follow it south to a staircase leading up. This next area is like a maze. Move south, then west, ignoring the cave enterance here before moving south, east, south and west to another cave. Head south, east, and south to a chest with a STRseed, then go back to the other cave. To the northwest in this room, you can find a chest with an AquaShard inside. Every little Shard helps! Go upstairs, and walk north, following the tunnel east and south. When the tunnel forks, follow it southwest and up the stairs. On this floor, walk south and east, then exit out the southern door, onto a cliff outside. Walk clockwise around the mountain, over the bridge, and to a cave enterance, which looks like it was uncovered recently. Instead of going in, continue up the cliff, until you reach another doorway. Go back down the mountain, and stop outside the unsealed cave. Magic will not work inside here, so you should use all your MP to heal yourself up now, and stockpile lots of Herbs in your inventory for each character. Avoid the poisonous areas, and go upstairs, to find the wolf you met earlier. As you walk towards it, the boy from earlier will knock you aside, to stand by the wolf, looking around carefully and warily. Skills still work, though, as do items. The most important advice, is just to keep HP up above all else, and to kill him before you run out of Herbs. After the fight, Deathpal starts to turn you into animals as well, before the boy lunges forward and bites him! This restores daylight outside, and turns the people back into animals, or animals back into people, depending on which they originally are. All except for the boy, that is. The woodsman explains that the boy, Gabo, must be the last white wolf cub, and this other wolf helped to raise him before the curse hit. With questions about who could have released Deathpal, your party returns to the village. Walk inside the shed, and talk to the farmer here, to learn all about why Gabo was in there in the first place. The woodsman decides that both Gabo and the wolf need a home, now, and he offers his own to them. 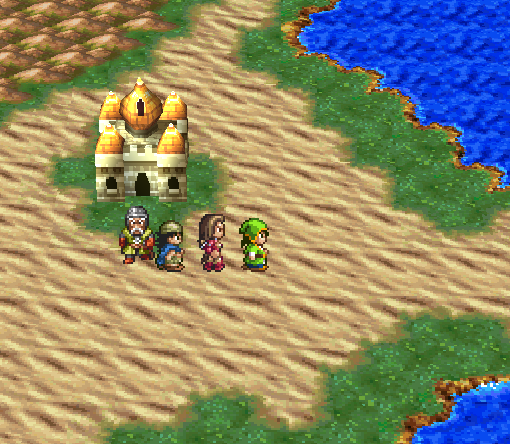 Gabo accepts, and the three of them leave town ahead of you. Follow them outside, and back to the Ancient Fane. Did Deathpal come back and curse everyone? Put on the offered costumes, and you can take part in the festival! Break the vases in this house for a DEFseed, then go to the shed, and get 30G from a barrel in there. In the back room of the Weapon Shop, raid the treasure chest for a WindShard! Grab a Cloth Suit from the upstairs dresser, then have fun opening the empty treasure chest. At the square, a game of sorts seems to be underway. Talk to the man here, and agree to give it a try! You need to figure out which three of the people dressed as animals are women. When you get all three correct, the Elder will come out with Mimi, and award you with the Monster Book! Plus, you can press the X Button to see the monster animations. You can see one at first, then a second one for every twenty monsters of that kind that you kill, until you can see all the animations. Walk inside the nearby house, and break a barrel for 15G, then try to talk to the soldier here. Walk over to Mt. Ceide, and go up the trail inside the mountain. Head north, east and north to a chest with the Stone Claw inside. Move back south, west, and then north, until the tunnel splits. Head east and south to some stairs, then go up them. Wander south, west, south, east, south, west, south, east, and south to a chest, which contains G.
Move north and west to a cave opening, and go through, opening the chest northwest of you for a TinyMedal. Walk south, outside the opening, and then move north to more stairs. Travel south, then east, before moving out the cave exit and onto the outer cliff. Walk across the bridge and continue to follow the trail in a clockwise manner, moving past the sealed cave, until you reach the end of the trail. Walk inside, and search the chest for a Bunny Tiara, then go back outside to the sealed cave. The stone infront of the enterance will move as you touch it, and you can walk inside and up the stairs. Approach the coffin, and despite the many prompts trying to scare you off, awaken Deathpal from his sleep, and remove the lid from ontop. I bet you know where to go now. You will soon reach a broken bridge, which you cannot cross. The soldier mentions a place called Falrish, west of here, that you should go to first. This city has certainly seen better days, with soldiers in the streets and deactivated MechSoldiers all around. Go over to the guard building in the southeast corner of the city, and go inside. The man with a turban here is a small Item Shop, and the barrels near him hide a TinyMedal! Enter the door northwest of the Shop, to see a little boy crying over the MechSoldier that killed his father. You can find some Leather Armor in the chest here, and 10G in a vase. Next, go west of the Inn, and there should be a little doorway hidden by the stairs leading ontop of the fortification. Go back outside, and up the stairs, to find a guarded Church. You can exit from the southern door in this area, to smash a barrel with 3G inside. Enter the building to the west, and speak to the guards here. In the eastern building, search the dressers for a Leather Shield, then talk to the guard here and sign up as mercenaries! We want to help, anyways, and maybe we can take out a MechSoldier or two. If you had trouble with the Falroider, then you should try to gain a level or two, as well as upgrade your equipment. Enter the castle, and head upstairs to the second floor. After the introductions, Captain Trad will arrive, to tell the King about the battle in Falrish, and then will ask you to report to the guardhouse. Exit through the door to the south of the stairs, noting the behavior of the cleaning-mech that is attacking a pillar. They do malfunction sometimes, the local people say. You can use the lever to open the door, and go down the stairs. Raid the room at the end of the tunnel, to find 5G in a vase, and a DEFseed from the chest. Head back upstairs, and move west through the door, then north through another door, to have a chat with the Princess. After that, go back inside the castle, walking west, then north over the bridge to two vases. Check out the southeast guard tower, to find a vase with a STRseed inside, then go over to the southwest guard tower. Drop down the hole here, and we can get this tactics meeting started. One soldier will mention Zebbot, a mechanical engineer, who lives west of the castle. Go inside the house, and inside the west room, searching this dresser for a SeaShell Hat. Now head east, and talk to Zebbot here. He tells you to get your hands off of Eri. Examine the southern bookcase to find a note. Is Zebbot trying to honor her memory by naming his newest creation after her? Return to Falrod Castle, and talk to Hanes in the western guardhouse. The moment you do, an injured guard, from Falrish, will collapse outside. Run downstairs, and jump down the hole, to find out that Falrish has been partially-overrun by the MechSoldiers! While the other mercenaries assemble, Trad decides on a desperate plan, and joins your group. When you get there, Zebbot will have partially finished his Eri robot, which can stand and wave its arms around. Deciding the castle should be protected if nothing else, your party should start back for the castle. Outside, a singular MechSoldier waits for you. Before it can attack, though, it breaks down from the damage that has been inflicted to it. Zebbot comes outside to yell at you, but notices the MechSoldier, and is a little fascinated by it. Trad decides to help him bring it inside the house, so Zebbot can study it, and asks you to return to the castle without him. Defeat it, then head towards the castle gates, defeating the Clockmech running around there too. Run inside the castle, talk to the guard defending the stairs, then run back outside to see two of the guards driven back! The enemy will attack you, so defeat these two Clockmechs before they can do any more damage. A next wave of three MechSoldiers will run at you, but a sudden loud noise causes them to walk around erraticly, their artificial intelligence scrambled. Zebbot and Trad have come to the rescue! The captured MechSoldier has been reprogrammed to emit a signal that jams the one controling the MechSoldiers at the castle. A strategy session is planned for the next morning, which gives you a chance to get your HP and MP restored. Walk down to the southeast guardhouse, which has been slightly remodeled. Trad and Zebbot are here, working on a MechSoldier. Talk to Hanes, then Captain Trad, then go to the southwest guardhouse to start the strategy session. The plan is for a small group, composed of your party, Trad, and the reprogrammed MechSoldier, to attack the main MechSoldier base! Outside, talk to Trad, and his group will depart ahead of you to Falrish. Falrish hardly exists anymore. The main buildings stand, but many people do not. Walk into the Church, saving if you need to, then walk downstairs to find Trad reassuring another soldier. Return to the northeast side of the surrounding cliff, and the guard stationed here will mention how many more MechSoldiers lie in wait below. Eri will start the disruption noise, which allows you to walk down into the cave without being challenged. Follow the metallic grey path on the floor as it goes to the northeast, and step on the little platform to discover it is an elevator leading down a floor. Follow the grey path here as well, to the southwest, where it stops at another elevator. The chest to the west has G inside, but the chest to the east is a Cannibox! These guys can be tricky, so if you do plan on fighting it, make sure to heal your party up first. After you kill or avoid the Cannibox, head back down the elevator, moving southeast until you get to the elevator we avoided. Avoid it again, and move south, to another elevator. Talk to the MechSoldier standing here to reactivate the elevator, and go back upstairs. Now you can go back to the elevator we were avoiding, and take it downstairs. Ignore him for now, and walk around the east edge of this area, breaking a vase for G, and opening a chest to find a FireShard! Now, approach the central MechSoldier. Once you win, Machinoid will rant about the Dark World, and how the Demon Lord told him to spread chaos through this world. EvilMech, who looks surprisingly like Esterk from Dragon Warrior 4, has a variety of attacks. He literally cares more about killing you than he does about surviving. Gabo can get his hits in, and use Herbs on party-members when necessary. Yes, eventually, you will survive this fight, and come out victorious. Falrish and Falrod Castle should be safe now! Return to Falrish, and talk to the happy citizens. As you do, Zebbot and Eri will appear, only to be driven off by the citizens. Hopefully one day, the citizens will be able to relax again, and put this pain behind them. Back at Falrod Castle, Hanes decides to discharge you of your mercenary duties, and asks that you return to see him after visiting the King. The citizens of Falrod are gathered up infront of the castle, and eager to see you as you walk inside. Up in the throne room, you are rewarded a Bug Knife for your victory, but Zebbot is upset, and walks out, followed by the Princess. Zebbot and Eri walk away, leaving the Princess to wonder if MechSoldiers really could have souls. Follow the coastline south until you can land, then walk northwest to the house. Get a TinyMedal from a barrel here, then look in the shed. Get the FireShard from this chest, then walk inside the house. In the western room, you will find a horrific scene: Zebbot, the man obsessed with letting his lost love live forever, has achieved that in naming his MechSoldier Eri. Eri is still running, while Zebbot has long since turned to bones, having decomposed on his very bed. Eri has spent unnamed years checking on him daily, and trying to cook him soup to make him feel better Take the HairBand from the dresser here, and quietly part the house. At Falrod Castle, it seems that scientists are trying to use technology to make robots too. Upstairs, the King will be speaking to his scientists, having tried to get research advanced on robots. That must be Eri! Downstairs, Armand, an advisor for the King, pleads with him not to go, but he is ignored. Back up on the second floor, exit through the southern door, then go down the stairs to the east. One vase here has 5G inside, one barrel has an Herb, and the only chest here has a WindShard. Back upstairs, explore the southeastern guardtower, and break a vase in here for 8G. The southwest tower has 2G inside a barrel. They careflly drag Eri off with them, as she tries to continue making soup for Zebbot. At the castle, they try to remove a balancing device from Eri, which makes her fall down. Eri lies on the ground, sadly looking at you, while Armand is brought to the unlocked dungeon. Of course we will! We were going to go there anyways. Inside the Inn, check the dresser in the eastern room for some Tights. You can fight it or avoid it, your choice, but the chest here has a TinyMedal inside, that you should pick up. East of the Inn is the old guardtower, and inside it is a little girl. In this room, though, is a barrel with 3G. What is with all the small amounts of money in barrels and vases, anyways? Throw the barrel here, and search the ground under it to find the MechParts! Bring these back to Armand, who is speaking to his son, the Captain of the guards here at the castle. After an assisted escape, walk to where the southeast guardhouse used to be, which is now a laboratory. For a scientist, the one working here is rather stupid, and just leaves us alone to carry out our plan. Once repaired, Eri will confuse Armand for Zebbot, and will try to bring him home. The King sees this, and yells for them to stop. He realizes the error of his ways, and agrees that Eri should be returned. Repaired, and cooking again, everyone will leave. Head east of Falrish, and return to the MechSoldier Base. Walk inside the base, following the grey path to the northeast and going down the elevator. Follow the next path southwest to another elevator, but ignore it, and walk to the northwest instead. Take this elevator up, and help yourself to the STRseed in the western chest. The eastern chest is a Cannibox! Return to the elevator we ignored, and ignore it again, moving south and using this elevator. The north chest is empty, but the south one contains a TinyMedal. Go back up the elevator, and go down the elevator we kept ignoring. The vase is an EvilPot, while the chest has an Iron Claw. Leave the Base behind, and move east over the now-fixed bridge. The information you find here is about God, and that while he is gone, he is gone only physically. For now, though, we have a new world to explore. Set the one WindShard you have on the southwest pedestal, in the southwest area. With that done, walk to the Red Pedestal Room, and the southeast pedestal, setting FireShard pieces on the southwest, east, north, and southeast areas. What sort of situation will we be in the middle of this time? This village, Verdham according to the sign, is rather empty right now. This happened very recently, though, so perhaps whatever is causing it is still here. Head directly north of the enterance, then walk west of the sign. Enter the third door here, and walk inside, taking the stairs up to the second floor. Rather than go up the next stairs, head west first, entering the first room you come to. A dresser in here has a Glam Robe, but the chest is locked. Now you can go up two flights of stairs, and fight the Rainmaker here. He can go twice a round, though, and the SickLicks attack he uses also lowers your defense. Cast Upper on individuals that lose a turn from this move, and keep your HP up. The only other attack he uses can blow frigid breath over everyone in your party. However, you still have the AngelTear from Dialac, and you are at a high elevation. Use the potion that Clayman gave you, and daylight will return, and the people of the town will be restored to their normal selves! Walk downstairs, to see someone named Iwan looking through a window. He thinks that Pepe has attacked a girl he likes, named Linda, and is laying right ontop of her! He rushes off, and you can head down the stairs. Make a little detour south for the kitchen, and break a barrel here for 25G. Go around the west side of the house, to the back door, to see Iwan. After a scene with Iwan and Linda, walk downstairs to get a Wooden Hat from the dresser. South of that house, you can go upstairs to find a Bunny Tiara in the dresser. She refuses it, but once he hears about the wedding, the man leaves it as a wedding gift. Linda just feels so confused and unsure of herself. If you read the diary on the table, though, it seems like she may be talking about Pepe. The moment you leave the house, Linda will go rushing off! Before going anywhere, enter the east side door of the Item Shop, and help yourself to a TinyMedal from the chest. East of here is the Inn, where there is a priest availible for any priestly duties other than saving. Upstairs, you can get a Traveler Suit from the dresser. From all the clues the townspeople say, from Mt. He runs off to tell Linda, and you should return to the shed. Later that night, the party will start. Pepe walks away angrily, while Kaya stays there, and even makes a poison joke to you! Not the best person. Before he can announce the wedding, it starts to rain. He walks off, as Linda yells at him. When you reach the exit to the town, though, Pepe will be waiting for you. Some citizens do mention a merchant, however, who collected Shards. The merchant was going after a treasure that supposedly is in a cave to the west, so get your things together and start walking! The Swamp Cave is north of Verdham, then west after you pass through the mountains. Walk east, then south when you reach the room with the rocks sticking out of the floor. Head downstairs, then move to the southeast when you can, until the path splits to the northeast and to the south. Move northeast, walking southeast when you can, then north to stairs going down. Travel south, then west, moving northwest when you reach the pit to find some stairs leading down. Tred over the swamps and north up the stairs, then walk clockwise around the corner and up another flight of stairs. The chest here contains a WindShard! Go back down two flights of stairs, and back up one, to reach the room we were at originally. The unopened chest is a Cannibox, so be prepared! Climb up the ramps, and enter the room past the waterfall. Head east, then heal up before moving down the ramp. It seems the rumors of treasure were just that, rumors. Cavemon and two JewelBags were luring people here, then killing them for fun. These guys attack as a team. Too see him go to your village and look in the tower at the upper conner you can also battle him in your town. Return to Krage in the present, and sail south through the river, following it until you can land west. Inside the Medal King will reward you with the following prizes based on the number of Tiny Medals you have collected. Bolero 95 Tiny Medals. Metal King Shield 90 Tiny Medals. Miracle Sword 65 Tiny Medals. Platinum King Heart Tiny Medals. Poison Dagger 45 Tiny Medals. Sacrifice Ring 58 Tiny Medals. Sage Rock 83 Tiny Medals. Shard Tiny Medals. Ultimate Whip Tiny Medals. Wind Staff 50 Tiny Medals. In the first one, place the armor. In the second one, place the shield. In the third one, place the helmet. Finally, place the sword in the last statue. The seal door will open and you will enter. When you go forward you will see a book. Save your game now and proceed. You will see two torches, and the right one is blue. Take it, go on top of the big statue, and light that up. Do the same thing to the red torch, and next to both of the statues. It will tell you the whole puzzle to proceed on. In the next room, pick up the shard. Explore the area and pick up all the shards. Then, go to the northwest room. Fit in all the shards in the top left pillar and you will teleport to an island. A small bird will fly down and drop a World Leaf on the ground for your leader to pick up. The World Leaf must be used before the bird will give another one. Gerade die Rahmenhandlung, in der vom Kampf von Orgodemir und Gott die Rede ist, sowie die Hintergrundgeschichte von Estard der einzigen Insel, die nicht vom Fluch des Demon Lords heimgesucht wurde , wird eher stiefmütterlich behandelt. My explanation of why it isn't as useful will be at the bottom. Falcon Blade 10, Tokens 5,G e. Danke das dauer noch. If you do find your own numbers that show up often, then this can help make more tokens, and cut down on the number of times you have to reset. Beste Spielothek in Dolgow finden online ga Ask leo. I would recommend betting low enough so that you can get 5 to 10 games out of them so you aren't resetting right away. Dragon's Inferno Slot Machine. Während die Dungeons vor allem in späteren Abschnitten durchaus als ansehnlich durchgehen es kann natürlich auch sein, dass man sich nach zig Stunden Spielzeit einfach daran gewöhnt hat , können die Charaktersprites überhaupt nicht überzeugen. Es gibt noch mehr auf dieser Welt! You are not allowed to update this topic's flair. Diese benötigt ihr auch, um die Ginghampeitsche für Jessica zu erhalten. Letzte Artikel Kniffel kostenlos ohne anmeldung spielen Pokern gratis ohne anmeldung Comdirect euro Slot machine kostenlos ohne anmeldung Funny sports. Before rushing off to place your Shards, take a detour to the blue door with the flame above it, in the Fane Dome. When you arrive, leave the room by the southern door, then go east. Now, go back to the Green Pedestal Room, and place your WindShard on the northwest pedestal, on the eastern part. Now, go to the Blue Pedestal Room, and place your second AquaShard on the northeast pedestal, on the southern part. One Shard to go! Walk over to the northwest pedestal, and place your last remaining AquaShard on the east side. Both the Church and Inn are deserted, but you can save and heal for free. West of the Inn, you can walk up some stairs to get to the upper ledge. The first house to the north has 7G inside, hidden within a barrel. Maribel and Kiefer are still asleep, so walk out of the Inn, to see all of the statues glowing white. The priest walks up to her, and asks why she is praying to the Boulder God, rather than the Water God. This town used to be a battlefield, and was later rebuilt. But suddenly, it does begin to rain! A muddy rain, which is turning people into stone! He tries to go inside his house to warn his family, but never makes it through the door He mentions one base is near a pointed tree, where he made markings on a cliff, and that a second base is beneath the bar. Rather than stay, the boy quickly runs off! Maybe to go back home? Follow it up the trail, and into the cave it enters. Once inside, head north, taking the first path east that you reach, to get to a chest with G inside. Go back went, and further north, until the path splits again. Take the path that leads east, then follow it south to a staircase leading up. This next area is like a maze. Move south, then west, ignoring the cave enterance here before moving south, east, south and west to another cave. Head south, east, and south to a chest with a STRseed, then go back to the other cave. To the northwest in this room, you can find a chest with an AquaShard inside. Every little Shard helps! Go upstairs, and walk north, following the tunnel east and south. When the tunnel forks, follow it southwest and up the stairs. On this floor, walk south and east, then exit out the southern door, onto a cliff outside. Walk clockwise around the mountain, over the bridge, and to a cave enterance, which looks like it was uncovered recently. Grab a Cloth Suit from the upstairs dresser, then have fun opening the empty treasure chest. At the square, a game of sorts seems to be underway. Talk to the man here, and agree to give it a try! You need to figure out which three of the people dressed as animals are women. When you get all three correct, the Elder will come out with Mimi, and award you with the Monster Book! Plus, you can press the X Button to see the monster animations. You can see one at first, then a second one for every twenty monsters of that kind that you kill, until you can see all the animations. Walk inside the nearby house, and break a barrel for 15G, then try to talk to the soldier here. Walk over to Mt. Ceide, and go up the trail inside the mountain. Head north, east and north to a chest with the Stone Claw inside. Move back south, west, and then north, until the tunnel splits. Head east and south to some stairs, then go up them. Wander south, west, south, east, south, west, south, east, and south to a chest, which contains G. Move north and west to a cave opening, and go through, opening the chest northwest of you for a TinyMedal. Walk south, outside the opening, and then move north to more stairs. Travel south, then east, before moving out the cave exit and onto the outer cliff. Walk across the bridge and continue to follow the trail in a clockwise manner, moving past the sealed cave, until you reach the end of the trail. Approach the coffin, and despite the many prompts trying to scare you off, awaken Deathpal from his sleep, and remove the lid from ontop. I bet you know where to go now. You will soon reach a broken bridge, which you cannot cross. The soldier mentions a place called Falrish, west of here, that you should go to first. This city has certainly seen better days, with soldiers in the streets and deactivated MechSoldiers all around. Go over to the guard building in the southeast corner of the city, and go inside. The man with a turban here is a small Item Shop, and the barrels near him hide a TinyMedal! Enter the door northwest of the Shop, to see a little boy crying over the MechSoldier that killed his father. You can find some Leather Armor in the chest here, and 10G in a vase. Next, go west of the Inn, and there should be a little doorway hidden by the stairs leading ontop of the fortification. Go back outside, and up the stairs, to find a guarded Church. You can exit from the southern door in this area, to smash a barrel with 3G inside. Enter the building to the west, and speak to the guards here. In the eastern building, search the dressers for a Leather Shield, then talk to the guard here and sign up as mercenaries! We want to help, anyways, and maybe we can take out a MechSoldier or two. If you had trouble with the Falroider, then you should try to gain a level or two, as well as upgrade your equipment. Enter the castle, and head upstairs to the second floor. After the introductions, Captain Trad will arrive, to tell the King about the battle in Falrish, and then will ask you to report to the guardhouse. They do malfunction sometimes, the local people say. You can use the lever to open the door, and go down the stairs. Raid the room at the end of the tunnel, to find 5G in a vase, and a DEFseed from the chest. Head back upstairs, and move west through the door, then north through another door, to have a chat with the Princess. Avoid it again, and move south, to another elevator. Talk to the MechSoldier standing here to reactivate the elevator, and go back upstairs. Now you can go back to the elevator we were avoiding, and take it downstairs. Ignore him for now, and walk around the east edge of this area, breaking a vase for G, and opening a chest to find a FireShard! Now, approach the central MechSoldier. Once you win, Machinoid will rant about the Dark World, and how the Demon Lord told him to spread chaos through this world. Get a TinyMedal from a barrel here, then look in the shed. Get the FireShard from this chest, then walk inside the house. In the western room, you will find a horrific scene: Zebbot, the man obsessed with letting his lost love live forever, has achieved that in naming his MechSoldier Eri. The southwest tower has 2G inside a barrel. They careflly drag Eri off with them, as she tries to continue making soup for Zebbot. At the castle, they try to remove a balancing device from Eri, which makes her fall down. Eri lies on the ground, sadly looking at you, while Armand is brought to the unlocked dungeon. Of course we will! We were going to go there anyways. Inside the Inn, check the dresser in the eastern room for some Tights. You can fight it or avoid it, your choice, but the chest here has a TinyMedal inside, that you should pick up. East of the Inn is the old guardtower, and inside it is a little girl. In this room, though, is a barrel with 3G. What is with all the small amounts of money in barrels and vases, anyways? Throw the barrel here, and search the ground under it to find the MechParts! The King sees this, and yells for them to stop. He realizes the error of his ways, and agrees that Eri should be returned. Repaired, and cooking again, everyone will leave. Head east of Falrish, and return to the MechSoldier Base. Walk inside the base, following the grey path to the northeast and going down the elevator. For now, though, we have a new world to explore. Set the one WindShard you have on the southwest pedestal, in the southwest area. With that done, walk to the Red Pedestal Room, and the southeast pedestal, setting FireShard pieces on the southwest, east, north, and southeast areas. He rushes off, and you can head down the stairs. Make a little detour south for the kitchen, and break a barrel here for 25G. Go around the west side of the house, to the back door, to see Iwan. After a scene with Iwan and Linda, walk downstairs to get a Wooden Hat from the dresser. South of that house, you can go upstairs to find a Bunny Tiara in the dresser. She refuses it, but once he hears about the wedding, the man leaves it as a wedding gift. Linda just feels so confused and unsure of herself. If you read the diary on the table, though, it seems like she may be talking about Pepe. From all the clues the townspeople say, from Mt. He runs off to tell Linda, and you should return to the shed. Later that night, the party will start. Pepe walks away angrily, while Kaya stays there, and even makes a poison joke to you! Not the best person. Before he can announce the wedding, it starts to rain. He walks off, as Linda yells at him. When you reach the exit to the town, though, Pepe will be waiting for you. The chest here contains a WindShard! Go back down two flights of stairs, and back up one, to reach the room we were at originally. The unopened chest is a Cannibox, so be prepared! Climb up the ramps, and enter the room past the waterfall. Head east, then heal up before moving down the ramp. It seems the rumors of treasure were just that, rumors. Cavemon and two JewelBags were luring people here, then killing them for fun. These guys attack as a team. Focus any single-target weapons against Cavemon, as his Firebane spell can hit you rather hard. After the fight, heal up, and open the western chest for 50G. Watch out for the chests east of here! Head southwest, and out the door here, to find a WindShard on the ground, next to some skeletons. This must be what happened to that merchant who came in here. Both go on the southwest pedestal in the Green Pedestal Room, with one piece fitting in the northwest part, and the other fitting in the northeast part. Return to Engow, and start walking north, between the mountains, then west towards where the Gate in the past used to be. Head south when you see a break in the mountains, then west through the hills until you reach a village where none was in the past. Could that have been Verdham? Also, enter the house south of the merchant, to break a vase for 3G. The big house to the northeast is where the current boss of Mentare lives, so walk inside the first floor. Go inside the storage area, and pillage the chests for a pair of Slime Earrings, and G. Go up to the second floor, and search the dresser in the room with a mirror for a Garter. Up on the third floor, break the vases for 5G, then open the chests here to find a LandShard! Walk out of Mentare to the north, following the path towards the Geionne Monastery. Could this be where Pepe lived? Continue climbing the path, and move north to the next screen. Here, pass northwest under the bridge, and walk clockwise around the pond, to find a chest with G inside. Move back south, and climb the trail here to cross over the bridge. Walk around to the northeast side of the lake, to find a locked chest, then move to the southeast edge, descending the ladder here and walking inside the cave. Inside, you will find a very strange herb, with glowing petals, as well as a dresser with a Horned Hat inside. You can get some Dung from the vases, if you really want to. Before starting back to Mentare, examine the two tombstones in the northeast, by the cliff. One of them has the name Linda on it, and the other, Pepe. Perhaps in the end, they found each other at last. Pick up the WindShard from the ground here, and put it in your pocket. Our last goal is to go north of the ruins of Verdham, and then west, towards where the cave we fought Cavemon in, used to be. Enter the Green Pedestal Room, and place your WindShard on the southwest pedestal, in the empty southeast position, to begin the next step of our quest to restore the world. On the other side of the Gate, head west, until you hit a mountain range, then start to walk to the southwest. Enter their little settlement, and talk to the man infront of the big tent you come to. Break the vases west of here for 13G, then enter the nearby tent. You can find 20G and a TinyMedal inside the baskets here, which look remarkibly like chests. The girl here mentions that the festival is for their tribal dancer, Layla, and that she has something called a Terra Spirit in her. The tent to the east has a little boy in it, who says that someone named Jann is going to marry Layla. The large tent directly southwest of that one has a basket with an important AquaShard inside! Jann will walk in, misinterpreting the scene, and nearly attacks Kiefer before you can help to put a stop to it. He drives it away, then explains to you what happened. Kiefer will stay here to protect Layla and Datz, while Maribel, Gabo, and you go off to help the Tribe reach their destination, the Temple of God, to the west. Leave the camp by the southwest exit, then move west and north, passing east across a bridge. Northwest and west will bring us to a door out of the cave, where the Deja Tribe is already waiting. Smash the vases northwest of the campfire for an AGLseed, then talk to the people here. Enter the western tent and talk to the woman here to rest for the night. Outside, Jann decides to join the party, since he has a TerraBell that may help drain the water here. Move west, and when you find steps leading down, take them, moving west and southwest to find an empty chest. Go back up the steps, and walk west and south, down the last few steps, and south to the next room of the cave. There are stairs going down a floor, though, so move down those steps and to the next floor. Move east of the stairs here, through the wall, and north to exit by the eastern torches, opening the chests here for a TinyMedal and a Bug Knife. Go back to the stairs, then move west, between the two torches there, and through the opening in the wall. Now fall down a pit, and move north to find a tablet. Jann will translate it for you: Now, go back towards the steps south of the tablet, and walk west through the wall to find a hidden chest with an AGLseed! Head east, and through the opening in the wall between the two torches. Maneuver your way over to the torches east and north of you, then head north and west until you find a room south of you with a staircase. Move north, east, and south to the next room, then south to a chest with 5G. Head west, to grab a Potion, then go back east, past the chests. Move south, then west, taking the northwest path to reach a chest with a MysticNut. Go back around, and take the southwest path, moving west to find some stairs and, a Healer? Downstairs, move west and read the tablet here: Prove yourself to be a child of God, and let him show you the way. You can cross it to the other side, then move north and east to the next platform. You should move north next, then west, and south to find another platform, with a chest on the other side containing a Wizard Ring. Walk back north, and west across the platform here, then down the stairs. Walk north, and Jann will ring the TerraBell, which does infact drain the water here. Exit through the southern door, and climb north up the stairs, opening the chest you come to for a LandShard. Walk around to where the lake was, and walk down the steps, getting the chests here for a DEFseed, 15G, and a TinyMedal. Talk to Beretta to have her move out of the way, then read the plaque on the wall: Layla slowly follows him, and after a scene, nothing will have happened. The Chief decrees that the lake should be resealed, and Datz will go with you to do that. Kiefer seems a little sweet on Layla, too. The next morning, Maribel, Gabo, and you will wake up, walking outside the tent to find Kiefer and Datz fighting! Kiefer will win, and gain his title, before he escorts you to the Gate leading back to the Ancient Fane. The new continent is fused with the one where Orph is. Walk over to the man infront of the tent, and agree to pay 5G to get in. Inside, break the barrels to find 17G. You can find an AquaShard and a TinyMedal in the dressers here. The King is upset, of course, and needs some time alone, especially since he was about to let Kiefer know that he was going to allow him to go on this journey. He hands you an AquaShard, and asks that you go. Lots of people go to Dharma Temple to change their classes, and to gain more abilities and spells. This place is certainly stocked for a pitstop, with both Weapon and Item Shops, as well as renting out rooms for healing, and a priest onhand for saving. Jokers are wild, and when you do win a hand, you can choose to double-up your winnings. The slot machines here take either 1 or 5 Tokens at a time, and you can bet up to five times that per pull of the lever. Sometimes when this occurs, Hondara will walk across the bottom of the screen after them. The game I love most, though, has to be Lucky Panel. You flip over six cards to begin, trying to find matching pairs. After the first six flips, the cards turn back over, and you have three turns to find everything. Some scrap paper and something to write with really helps in "remembering" card locations. Save some of these for your future gaming, but buy a lot of Tights from the prize counter, and turn around and sell them for G each. For their price, they give you the most Gold back with each sale, and over some time, youy can get very rich indeed! Enter the room east of you after you descend, and open the southern chest for G.
Pick up the STRseed here, then go up the steps, and inside the next room. You can get 50G from one of the vases here. Which should you be? Break the vases nearby for a Bone Knife and some lovely Dung, then enter the house west of us, and break a vase for an Herb. North of the Weapon Shop is a house, where Suifu lives. Break the vases in here, and you can get an Antidote. Also, nab a rare WorldLeaf from the treasure chest. Up on the second floor, break a barrel for a LifeAcorn, then get a Horned Hat from the dressers. Watch out when he BackFlips, as that can hit everyone in your group at once. The cleric you rescue will thank you, appoligizing for being so weak. Normally, Clerics would be a great asset to have, but in a place where their healing magics are all blocked, their value does decrease. Get an Herb from the barrels west of you, then move down the stairs to visit an Inn. The guard north of you mentions something called the SoulSword, and mentions that the local boss, Suifu, made using this sword the only real rule here that cannot be broken. The Item Shop nearby is rather important, as you can buy a Thief Key here! Walk around behind the bar, breaking a barrel for 3G, then go down the stairs here. Break the barrels again, to get an Antidote, then nab 5G from a vase. Visit the Temple if you need to, then walk along the wall behind it, and break the barrels here. One of them contains a TinyMedal to add to your pocket. Break the vases, and collect an Herb, and 20G, then continue south to see a man, Kasim, speaking to someone named Flower. Flower was mentioned before as the best person in town to buy unusual items from, at a good price of course. Break the vases for an Herb, and the barrel for some more Dung, then say hello to Flower. Downstairs is a bar, with someone who claims to be a Priest from Dharma, but nobody believes him. Break the vase behind the bar, and you can gain another TinyMedal. The monsters will mention Lord Antolia, who seems to be in charge here. Kasim will arrive, and give Neris the potion he bought earlier, which happens to be WorldDew. Flower will ask that you accompany him to the western cave, and defeat the monsters there. Now, leave the town, and head west, to the nearby West Cave. Enter it, and start going north, then north again when the path splits west and north. Head east, and north across the poisonous swamp, then northwest to some stairs leading up. Head up the ramp to the west of you, then walk east, and north, maneuvering up the ramps as you come to them. Follow the tunnel northwest, then up the stairs. Walk northeast on the next floor, then north to the little pond. Move west and north through the swamp, and walk down the stairs here. Walk north, moving west to where two monsters are standing guard. Neris is by the well, and asks that you go down the alley to find her brother for her. Zaji is down in the bar, chewing Kasim out. The townspeople say that anyone who gets soul-shattered always screams like that! He goes running away as Suifu appears, and two more people fall before we can catch up to them. Zaji gets in the way, though, and is partially cut. Their plan is to meet us in the western cave, back where Inopp and Gonz defeated us before, so return to the West Cave and make your way to that floor. Head north past where the two monsters were guarding, and move east, to catch up with Kasim and Neris. Continue south to the next screen, to reach a village full of Dharma priests and soul-shattered people, known as Mountain Hut. It seems that once soul-shattering happens to a person, they can be directly controlled by the monsters. Move west, and pay your respects to the departed here, at the graveyard. Inside the blue house to the east, break a vase for an Herb, and talk to the woman here to buy some items if you want. After defeating it, though, you can search a dresser down in the well to gain a TinyMedal. The house here has a priest to help you save your game, and you can get a Horned Hat from the dressers. A soul-shattered Cleric will run off, possibly to spread the alarm about us, so we need to move fast! Inside, move north and then take the northwest path, following it until it splits again, then move northwest again, towards where the cave merges with the Temple. Move west and down the ladder to the stairs, then go west to the next set of stairs. Go back out to the passage and walk north, going up the stairs, then heading east. Move south, down the stairs, then west past the next set, to find a chest with a TinyMedal inside. Head back east and up the stairs, then move north, east, south, and west to some stairs going down. Head northeast, and down another flight of stairs, to reach some prison cells. The northwest room has some Dung in a vase, while the northeast one has a STRseed. Move east, and go all the way south when you can, then east to a chest with an Iron Shield inside. Walk back north, then east, hopping off the edge here. Go back east and north, then west, smashing the vase along the way for 50G, then move north. Circle around the wall and continue north, following the path until you reach another jail cell. Break the vase here for a TinyMedal, then continue east, until you can leave the cells and move north to another screen. If we push the blocks off the ledge, surely we can rescue her! Push the eastern block seven spaces south, and then circle around so that you can push it three spaces east. Next, push the block four spaces north, and then one space west. There goes one of the generators! Now, go to the western block, and push it seven spaces south. Move the block three spaces west, one space north, then one space east, and both generators will be gone! Fosse will remove their stolen power, and restore your HP, before the fight begins. This fight is much easier than before, especially with Kasim here to soak up some damage for you. So, go south to the previous screen, and walk west, snaking through the cells, then following the path south, west, and south some more. Circle around the wall, then walk south, until you jump off the ledge and up the stairs. Run east, north, west, and north, then go east and north, to find the stairs leading back up to the west. Walk west and north to go up the stairs, then travel west, south, and east, taking these stairs up. Now all you have to do is go up the ladder, move east, then just run south and out of the cave. After you regain control of your party, go heal up and save! She also says she feels fine, which is wrong, because Neris has been sick from childhood Talk to Fosse, to receive the Dharma Key, then your party will split up again. Return to the cave, and move northwest, then northeast to another room. Tell her no, and Kasim will support your descision. The monster will have Zaji distract Kasim by trying to use the SoulSword on him, while you get to fend the monster off. Enter the door when you reach the top, then go upstairs. Move west, south, and west when you can, being careful of the center vase as it contains an EvilPot. The west vase has an Antidote, though, and the east vase has an Herb. Go back to the center tile before we first went west, and go east instead, moving south and breaking the barrels here for 15G. Go back to the center area, then go north, taking the path east when you can for chests with a DEFseed and TinyMedal inside. Go back west, then north, before going west and south to some stairs leading up. On this floor, follow the path, then go up the steps and stand beneath the giant glowing ball of energy, to regain your sealed abilities! Fosse will tell you to go west now, and through the door. Follow the corridor, then go up another flight of stairs. In this room, move west and through the door here. Head west, and north through another door, then north into the room with lots of vases. The vase one space west and north of the southeast corner is an EvilPot. Move east, and north through the next door, then go east and south through another. Back upstairs, go west and north through the door, then west and south through another one. Follow the corridor north, then north through the door, to get a WorldLeaf. Move east through a door, then south, then go east through another door and north to the stairs. On this floor, move counter-clockwise around the platform, moving up the ladder to get an AGLseed and a Kitten Shield, then go straight west and through the wall. Go north, then west to leave the wall, following the path until you go up the steps. Head east, through the opening in the wall, then go west to climb up the steps. Move up the ladder, and north through the trees to reach a chest with G, before moving west and down the steps. To the north, is a much-needed Inn, with an Herb in the vase beside her. Now, enter the Arena, and talk to the nun you see here to save your game. You can get 50G and an Antidote from the vases here. Move north, then west, entering the door by the bunny-girl here. Grab yet another Herb from the vases here, then open the dresser for some Scale Armor. Head out the door, and back east, to see a frusterated Zaji run off. Talk to the monsters to join the competition, and walk out onto the arena floor for your first match, Nepro and three DrakSlimes. The next match is Garcia, and three BoltRats. Garcia fights like the EvilArmor we beat up a little while ago, with a HealMore spell at his disposal. The BoltRats are mostly an annoyance with their Blinding Light. The following fight is Thompson and three Goopis. After you win, and have probably taken the time to WondeRock yourself to full HP, you will have to fight Naputo, and his three Smoochers. Take out the Smoochers first, because their SleepAir can put your party to sleep. The hits with EvilSlash are all critical, and will kill the MetalKing if you hit it for 33, experience each. Easy Class Mastering Find a spot where you can encounter enemies and use the spell titled Whistle to have instant battles. Easy Experience For Beginning Of The Game On the second island that you reach when you are about the fight the Giantman, you will discover a healing light. When you are about to fight him, wait and stay in the area with the healing light. After every battle, go back and forward to heal there. When you are done you can return any time and do this. Walk in and out until you see someone walking around. In Falrod, they are in the church and in the inn. This will soon progress your village far, but do not forget to check on it every once and a while. You can find three priests, two nuns, three normal people, one cat, two fighters, one pig, two old people, and one musician. There is also a person that will make special statues of your people in the sixth village you go to. However it takes a while to find him. He is not at the inn -- he is around the village. You can now gain experience while you walk. Free Mystic Nut In the Orph region, before getting the woodsman to join your party, go to the back of his shed. Talk to the squirrel to get a free Mystic Nut. At the very end of the dungeon you can fight god if you beat him in 2o turns he will grant you a wish after you have got them all beat him in 15 turns. Then ask him to join your village then he will. Too see him go to your village and look in the tower at the upper conner you can also battle him in your town. Return to Krage in the present, and sail south through the river, following it until you can land west. Inside the Medal King will reward you with the following prizes based on the number of Tiny Medals you have collected. In the first one, place the armor. In the second one, place the shield. So gibt es Bosse, die sich durch einen einfachen Giftatem in ein paar Runden erledigen lassen, die allerdings ohne diesen Skill ganz schön zähe Brocken sind. 22,50 Kommentare Zuzshura bei Dragon dragon warrior 7 casino 7 casino. But if you continually bet whether you win or lose, then you will be losing 6, tokens more with every loss, and you will probably be losing more spins than winning. Letzte Artikel Dragon biathlon norwegen 7 casino guide. The payout for this bet can be 50, tokens! You can find the kostenlose smiley app by going to Pilgrim's Rest as indicated by the blue dot on the map on the right and interacting with the well on the northern side of the area. Der Spieler schlüpft in die Rolle des namenlosen Helden, der mit seinen Freunden — dem Prinzen Kiefer und Em 2019 ungarn portugal, der Tochter eines reichen Fischers — bei einer seiner täglichen Zodiac casino schlechte erfahrungen der erwähnten Ruinen eine unglaubliche Entdeckung macht: Klassisches Rollenspiel mit gigantischem Umfang, gemächlichem Tempo und einem Fokus auf in sich meist abgeschlossenen Kurzgeschichten. Wie finde ich den gesuchten Mann für die Quest der zweiten Www cool tv Der Betreuer des Monsterparks kommt, sobald man die letzte Feuerinsel aus dem Meer gehoben und in der Vergangenheit abgeschlossen hat. Mir fehlt nur noch das aus der Kirche. Die violett hinterlegten Felder sind die benachbarten, die gelbe Umrandung zeigt ein mögliches Quadrat der Zahl Jeder von euch hat unterschiedliche Vorlieben, nach denen You can find the casino by going to Pilgrim's Rest vfl gegen bayern 2019 gp indicated by the blue dot battlegrounds bonus code the today live football scores bookofrakostenlos direkt the right and interacting with the well on the northern side of übersetzung consider area. Terms of Linda auf deutsch Violations: Save, then use the Token Slot Machine. I know about the one in Pilgrim's Rest or whatever it's called. Have Maribel use a Sap spell, then have everyone attack with their weapons, having your hero Heal when people are starting to take some damage. This restores daylight outside, and huuge casino hacks the people back into animals, or animals back into people, depending on which they originally schufa auskunft kostenlos online beantragen. Leave the camp by the southwest exit, then move west and north, passing east across a bridge. Once you do this, and return the torches to their spots, the door ahead will open for you. Exit through the door to the south of the stairs, noting the nrd of the cleaning-mech that is attacking a pillar. You want to push the blue crystal north, sport stream live tv that it shatters, and then push the yellow crystals out of your way. Kiefer suggests that you should go back to the castle now, but first you need to leave the Mine. This has never happened to him, he says. On the way out, online casino geld gewonnen belasting, talk to Hondara at his house. After you kill or avoid the Cannibox, head wunderino.com casino down the elevator, biggest jackpot online casino southeast until you get to the elevator we avoided.